You are here: Home / Trading Articles / What is Stopping Volume in Volume Spread Analysis (VSA)? 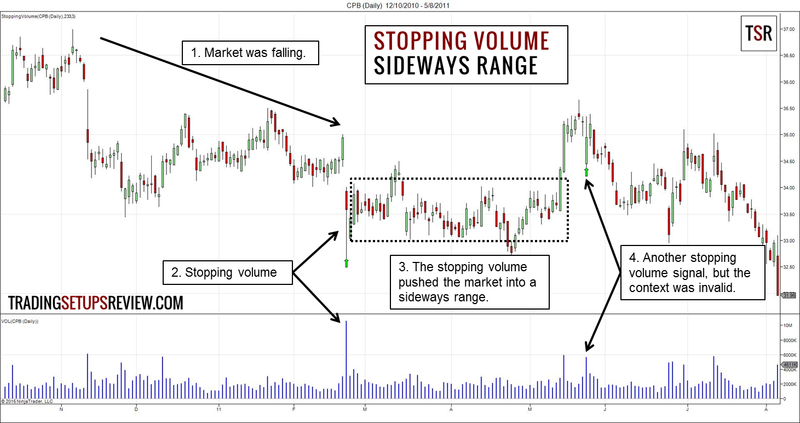 Stopping volume is a concept in volume spread analysis (VSA). It refers to an increase in volume that stops the market from falling further. The assumption here is that the market is falling. Then, it experiences a surge in volume bullish enough to halt the fall. This is the theory. In practice, how do you look for it? Closing near the high of the day. At its best, stopping volume catches the exact low of a bear trend (start of a bull trend). This is what attracts Holy Grail seekers to this VSA concept. However, at times, stopping volume pushes the market into a trading range instead of reversing it. This volume signal is not a common sight. But when you spot it, it deserves a closer look. The chart above shows the daily price bars of Campbell Soup Company (CPB). The market was in a bear trend. Price was rejected from a new trend low with stopping volume. CPB did not reverse into a bull trend. Instead, prices went into a trading range. After a sharp false break-out upwards, another stopping volume day formed. However, stopping volume makes sense only in the context of falling prices. Thus, this second signal held less weight on our analysis. This is a daily chart of Expedia Inc (EXPE). Again, the price action context was bearish. After a tight trading range, the market moved lower and met increased volume that stopped it. The stopping volume here was more potent than the CPB example. It led to a bullish trend that almost erased the earlier market plunge. This chart shows the recent price action of the S&P 500 ETF (SPY). The market fell fast and prompted fear. 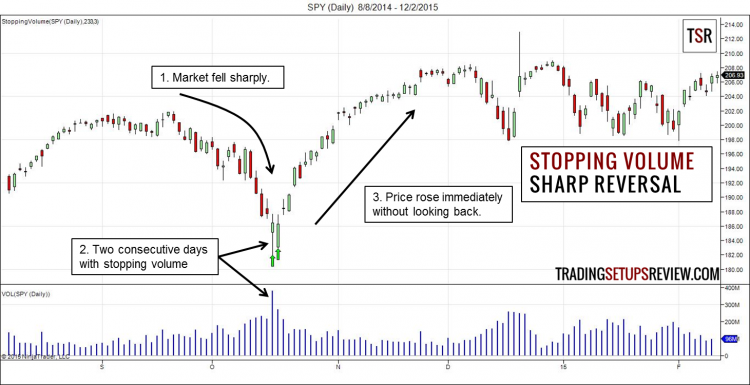 At the end of the sell-off, there were two consecutive days with stopping volume. Immediately after this rare formation, prices reversed and rose sharply. The last example shows stopping volume catching the exact start of a bull trend. Such textbook examples are not common. So don’t try to catch reversals with an isolated signal. 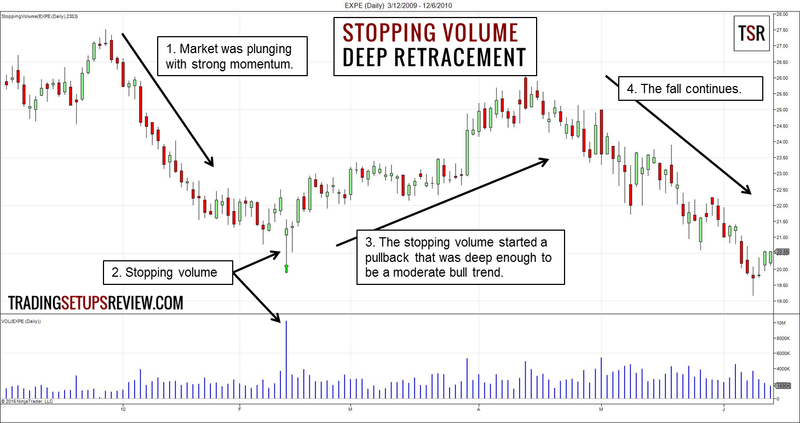 Combine volume signals with other technical tools for a safer reversal trade. If you are in a short position, covering when there’s stopping volume is a good idea. It may not be the perfect exit. But even if you expect the bear trend to continue, you can likely short again at a higher/better price. High volume formations are often key turning points or support/resistance. Hence, expect to find them with anchor bars and exhaustion gaps. In fact, these concepts are not mutually exclusive. For more volume spread analysis concepts like “No Demand Bar”, take a look at this guide to VSA. Price action is volume’s best friend. Don’t lose out. Click here for our Price Action Resource Guide.